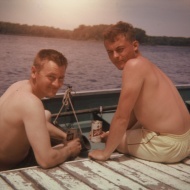 My Dad and someone he knew back in 1965. A great ad for Schlitz, maybe. Genesee Theater, Waukegan, Illinois. It never looked like this in the 60s. But layers and layers of popcorn grease were no doubt removed in the restoration of this masterpiece. I saw Jaws, Papillon, Planet of the Apes, Sound of Music, Oliver, and a whole bunch other movies there. Twiggy. 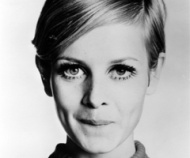 She played a huge role in women's fashion in the 60s - again, I was in early grade school years but I remember alot of focus on Twiggy. 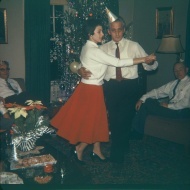 Pre-fininist movement (correct me if I'm wrong). 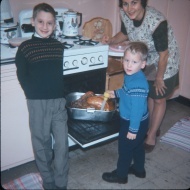 Thanksgiving -- 1966 - our old house on Glenwood, Waukegan, Il. This is Betty. This is her ironing board.